Please select the article you wish to read. CCVF is pleased to announce its continuing support of the psychological counselling program at York University through another grant for 2019. The program provides free qualified counselling for victims of violent crime and parents and siblings of homicide victims in York Region. 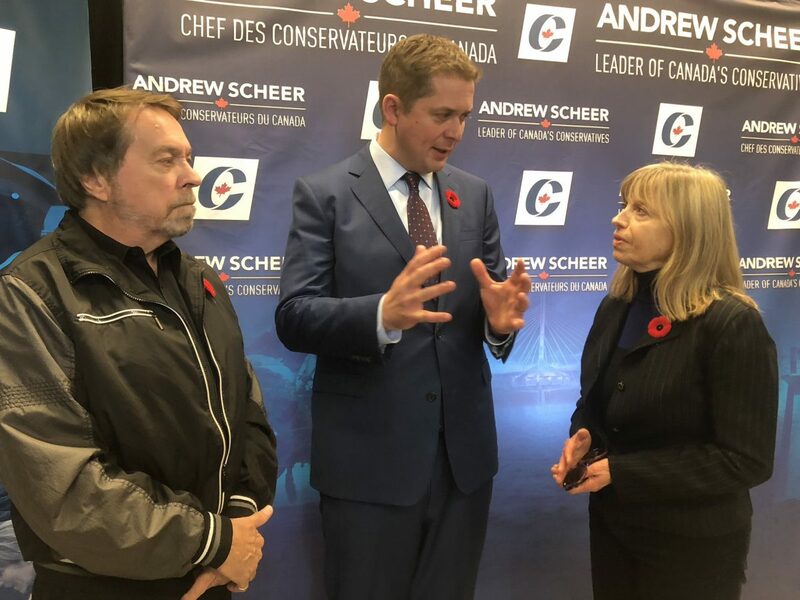 Joe and Lozanne meet with Andrew Sheer to discuss and support tougher sanctions on criminal gangs that prey on innocent Canadians. We are pleased to support initiatives that recognize that victims lives have value and community safety must be foremost in in the eyes of our Federal Government. 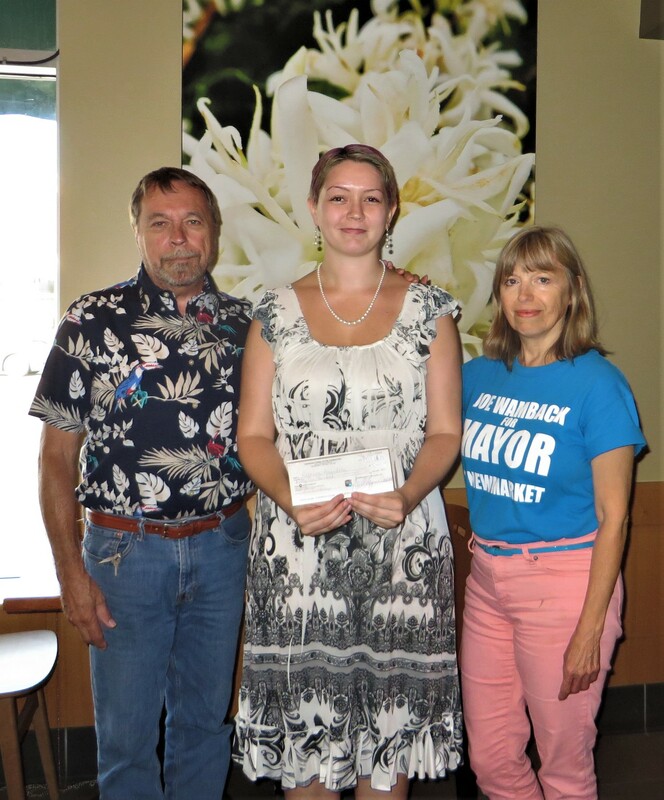 Today, Lozanne and I presented Rebecca with our 2018 CCVF Scholarship. When we learned of Rebecca’s trauma caused by violent criminal assault and lengthy judicial process we became so impressed with her strength and courage we had no difficulty helping her. Rebecca will continue her education with hopes to become a Social Worker to help others found in similar circumstances. We are so proud of her and wish her every success with her future. You can see Rebecca’s story on the link below. The Canadian crime Victim Foundation urges all Canadians to write their Member of Parliament to stop Bill C-75, currently before the House. This proposed legislation was introduced by the Government and sets an extremely dangerous diversion of our justice system weakening any gains made by victim advocates over the past decade. Serious Crimes that were indictable offenses are being changed to summary offences resulting in little or no jail time. Some of the following will now be subject to a fine only and others subject to a maximum 2 year sentence which allows the offender to seek parole after serving 1/6 of their sentence or 4 months. Remember that indictable offences are some of the most serious crimes recognized in the Criminal Code of Canada. 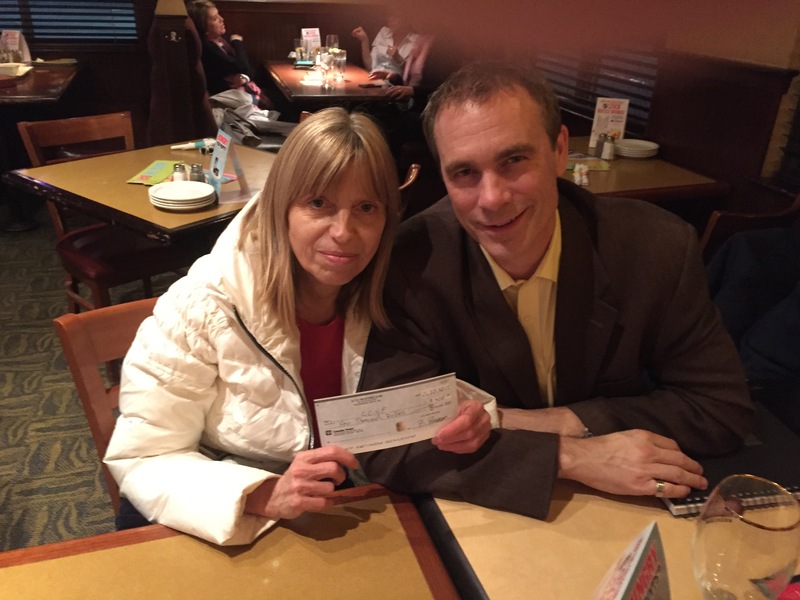 The Canadian Crime Victim Foundation is honoured to receive a donation from Daniel Scott and Darya Scott. 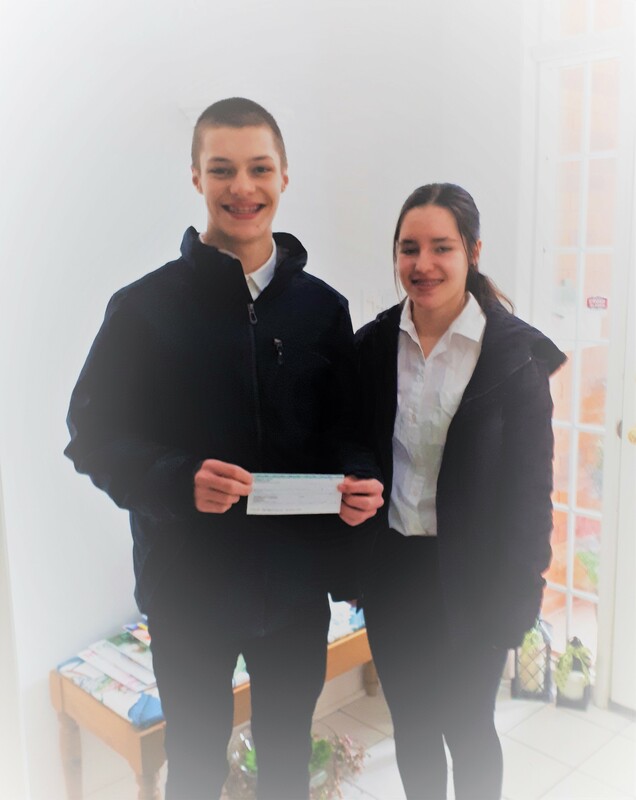 Daniel and Darya are students from Newmarket who collected the donations and we are pleased to confirm that all funds collected will be used to provide qualified psychological counselling at no charge to innocent victims of violent crime in York Region through a program at York University funded by through the foundation. Thank you Daniel and Darya. We are proud of your hard work, energy and compassion for others. Canada is without a National Victims Ombudsman. The Federal Government has know about this upcoming vacancy for years. Sue O Sullivan left this post over 4 months ago. Many qualified Canadians have applied for this position from the time it was posted in April of 2017 yet the government refuses to make an appointment. Please write or email your MP and demand that this office position be filled to assist those that have lost so much through violent crime. We need a voice on the federal scene. The Canadian Crime Victim Foundation believes that every woman and child has the right to live a life free from violence and oppression. For many, this right has been violated. These shelters are for women and their children fleeing abuse offering a free, safe, caring home and the counselling and support women need to heal and plan for the future. The Canadian Crime Victim Foundation is please to announce that it provided research funding for a pilot project at York University to assess the effectiveness of dog therapy in women’s shelters in Toronto. The results were overwhelmingly successful. The majority of participants confirmed that the dogs presence helped them feel calm, relaxed and assisted with stress reduction. 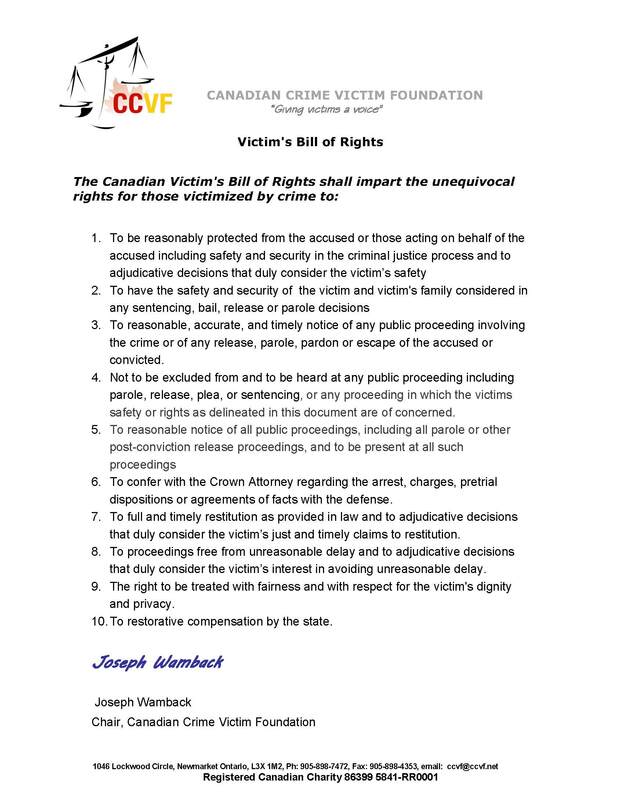 Together, over the past 15 years we have raised in excess of $850,000.00 and we are again pleased to confirm that the CCVF has no paid employees or directors and that all funds collected are distributed through the foundations efforts to support innocent victims of violent crime in Canada. We are happy to confirm that we are continuing to fund free psychological support by qualified psychologists at York University for victims of violent crime in York Region. The CCVF has partnered with York University to provide these services which in most cases are not available when needed and not affordable to those that need them the most. The Foundation also awards bursaries and scholarships to victims of violent crime to assist them with their future endeavours in life when they have had so much taken from them and no other avenue of support. The Canadian Crime Victim Foundation remains the only organization in Canada that provides this desperately needed service. We continue to work with all levels of government to engage in providing these services to what we consider to be those most marginalized and forgotten citizens of Canada. Chair Canadian Crime Victim Foundation. The Canadian Crime Victim Foundation encourages all Canadians to participate in this survey. Perhaps, just perhaps, we can entrench Victims rights in our Charter to provide treatment for Victims equal to the rights of the accused. The Minister of Justice and Attorney General of Canada is reviewing the Criminal Justice System to identify aspects that need to be changed and/or updated. 3) Visit the Departments Transforming the Criminal Justice System website. 3) Visit the Departmentâ€™s Transforming the Criminal Justice System website. REMINDER: Register Now for the 2017 Victims and Survivors of Crime Week Symposium! Victims and Survivors of Crime Week is taking place in Canada from May 28-June 3, 2017, under the theme of Empowering Resilience. Register now for the federal symposium in Calgary, Alberta on Monday, May 29, 2017. Live-stream the event from anywhere. The deadline for registration is May 22, 2017, or until capacity is reached. For more information, the symposium agenda and registration, please go to http://www.victimsweek.gc.ca. Please share this invitation with friends and colleagues. I am pleased to share the following information about Victims and Survivors of Crime Week (VSCW) 2017, which will take place May 28 – June 3, 2017. I invite you to participate along with the Correctional Service of Canada (CSC) in this important annual week. This year’s theme of VCSW – Empowering Resilience – strives to highlight the work that the government, professionals and volunteers have accomplished and to build on that momentum to continue our work in support of victims of crime. This week gives us an opportunity to become more aware of victim needs and to learn more about the services that CSC, other federal government partners and non-government organizations offer to victims. It also helps us focus on those who have been impacted by crime and how CSC is contributing to community safety as part of its mandate. CSC is committed to ensuring that victims with federal offenders have an effective voice in the federal correctional and justice systems. Its’ Victim Services staff consults on a daily basis with victims, victim advocacy groups and others to ensure victims receive the services they are entitled to. CSC strives toward learning more about victim issues in order to better serve Canadians and specifically victims of crime. To learn more, please visit www.victimsweek.gc.ca. For more information about CSC Victim Services, please visit www.csc-scc.gc.ca/victims-victimes or email victims-victimes@csc-scc.gc.ca. Registration for the 2017 Victims and Survivors of Crime Week Symposium is Now Open! Registration for in-person attendance and live-streaming is free and includes access to all plenary sessions and workshops. For those attending in person, complimentary coffee breaks and lunch will be provided. As space is limited, we encourage you to register early. Registration is on a first come-first served basis. For more information, the symposium agenda and registration, please go to http://www.victimsweek.gc.ca. The deadline for registration is May 22, 2017, or until capacity is reached. The Federal Government is now advertising for a replacement of the existing Federal Ombudsman for Victims of Crime. This post was held by Sue Sullivan and she has done a valuable service to Canada and Victims of violent crime. The following is a link to the advertisement. Lets hope that the replacement is not a political appointment but will include someone that will carry the legacy and fight for victims rights in Canada. We are pleased to confirm that again for 2017 the Canadian Crime Victim Foundation will extend and fund the Psychological services program at York University for those who have been the innocent victims of violent crime. The counseling services provided will be free of charge to those who qualify and will be conducted by qualified staff at the University. For applications please contact us at wamback@sympatico.ca. The Canadian Crime Victim Foundation is pleased to announce and wishes to thank the following Corporations for their generous support and generous donations to …our scholarship and psychological counselling programs for 2016. Registration for the 2016 Victims and Survivors of Crime Week Symposium is Now Open! Victims and Survivors of Crime Week is being held from May 29-June 4, 2016. A federal symposium will be held in the National Capital Region on Friday, June 3, 2016, to raise awareness about issues facing victims and survivors of crime and the programs, services, and laws in place to help victims and survivors of crime as well as their families. Registration for the Symposium is free and includes access to all plenary sessions and workshops. Complimentary coffee breaks and lunch will be provided. As space is limited, we encourage you to register early. Registration is on a first come-first served basis. Please note that participation for federal government employees is limited and needs to be accompanied by the approval of a Director General level supervisor. For more information, the symposium agenda and registration, please go to http://www.victimsweek.gc.ca. The deadline for registration is May 27, 2016, or until capacity is reached. The amendment proposes to provide Employment Insurance benefits for parents and families of murdered loved ones to a maximum of 18 months or 78 weeks. It will equalize access across Canada and is not be subject to individual Provincial limits or agencies. recognized by Canadian society. In many instances the prolonged re-victimization through the criminal justice process can be as devastating and as long lasting as the original crimes committed against them. Especially vulnerable are family units and siblings of murder victims and other survivors of violent crime that find themselves isolated and in financially compromised family units due to the life-altering aftermath of violent crime; a life-altering environment caused through no fault of their own. Most families of murdered children are not financially prepared for the aftermath of violent crime and many employers can only offer the earned vacation credits available to the wage earner which is grossly insufficient to prevent financial disaster accompanying the never ending grief for survivors and victims of violent crime. Currently these circumstances are not recognized in Canada by any supportive Federal, Provincial or Municipal agency. It is the intention of this proposed amendment to help redress this unfair imbalance for those across Canada who have been victimized by acts of violent crime by providing financial support during extreme and often crippling psychological stress and grief caused by acts of violent crime perpetrated on their loved ones. When a family looses a child or loved one to violent crime studies have shown that the grieving process may not commence for many months even years after the criminal act and is protracted by the judicial process. Criminal Injuries Compensation varies from Province to Province and Ontario maximums are limited to $25,000 per occurrence. Due to the very nature of the confrontational award process many victims do not apply or fail to access the funds due to lack of support within the system. The existing Employment insurance Act allows 15 weeks for sickness benefits and 15 weeks for compassionate care. Many victims are so paralysed by grief that they while they may qualify for sickness benefits these benefits were not the intent of the legislation at the time, nor is 15 weeks of benefits adequate to support grieving parents. 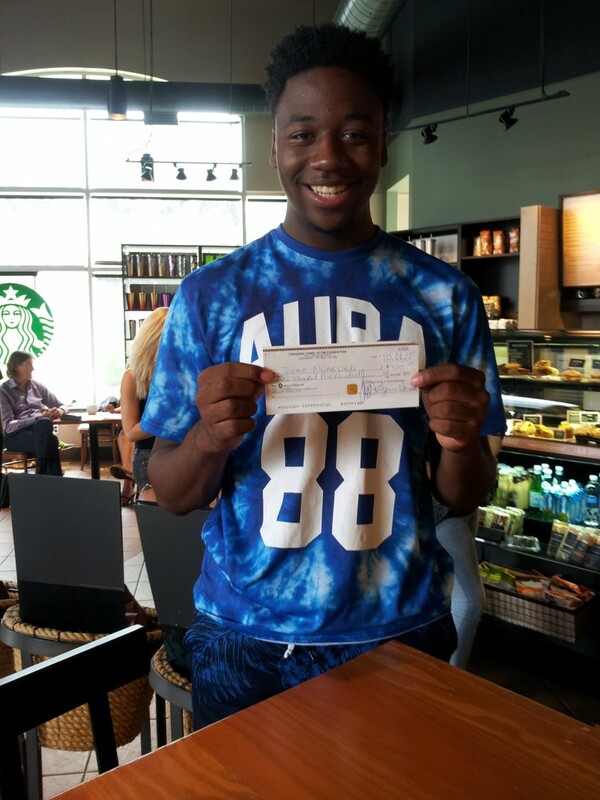 These funds will assist the Foundation to continue its work providing post secondary educational opportunities for innocent survivors of violent crime and siblings of innocent homicide victims. In addition this contribution will assist us in continuing our funding at York University providing free psychological counseling of victims in York Region. 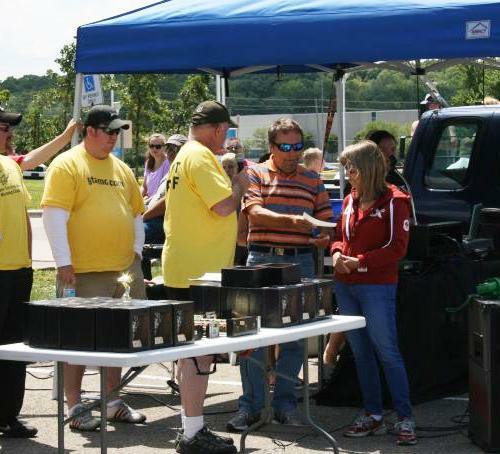 We are pleased and honored for the continued support from the executive and members of the GTAMC that assists us in helping those who have lost so much.